Dried banana chips are typically eaten as a snack or with nuts and chocolate. Because the chips are made from fruit, you might assume the chips are healthy. While they contain a few essential nutrients, banana chips can be packed with high amounts of sugar as well as saturated fat. One-half cup, or 34 grams, of dried fruit is equivalent to 1 cup of fresh fruit. Overeating dried fruit can be easy, so make sure to measure your portions and try to not eat straight from the bag. One serving contains 176 calories, 20 grams of carbohydrates, 11 grams of total fat and less than 1 gram of protein. 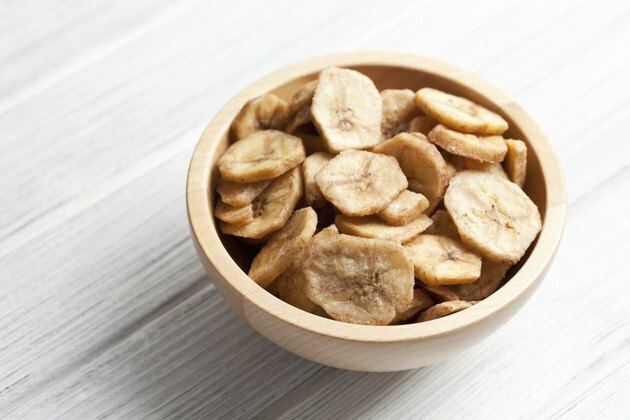 One-half cup of banana chips contains 4 percent of the daily recommended intake of potassium, 6 percent to 8 percent of magnesium, 3 percent of phosphorus and 4 percent to 6 percent of vitamin A. Potassium, magnesium and phosphorus function as electrolytes that help maintain fluid balance. Vitamin A promotes eye health and helps strengthen your immune system. While fruit naturally contains sugar, refined sugar is often added to dried fruit to enhance the sweet flavor. One-half cup of dried banana chips contains 12 grams of added sugars, or 3 teaspoons. Large amounts of sugar can lead to obesity, diabetes and elevated triglycerides, or fat in the blood. Buy dried banana chips with no added sugar to help reduce excessive amounts of sugar and calories. The American Heart Association recommends that the average adult consume less than 16 grams of saturated fat per day. One serving of banana chips contains 10 grams of saturated fat. Therefore, banana chips contain more than 60 percent of the recommended amount for the entire day. Choose My Plate: What Counts as a Cup of Fruit?